When you get ready to file a claim for disability, you have many options. Many people go to the Veterans Administration (VA) and get a representative called a national service officer (NSO) to handle the claim for them. This would be organizations like the Disabled American Veterans (DAV), or the AMVETS. If you are going his route, the DAV is trained by the VA and has access to some of the VA databases. You have to give the a specific power of attorney (POA) to one of the service organizations. I would read the Roche book first because it provides a more general review of the claims process. It also covers a lot of other VA programs you may have little interest in. The AskNod book is specifically devoted to Disability Claims. You can also submit specific questions to the blog author. You can file a claim using the old fashioned VA Form 21-526 . There is also an online version called the VONAPP see http://vabenefits.vba.va.gov/vonapp/main.asp. The best way to file is a Disability Benefit Questionnaire (DBQ) that is signed by your doctor. The DBQ is in Acrobat format and can be completed online and filed in the VARO's Veteran Center. You can mail it to the VARO by certified mail with a return receipt. You must write in a nexus staments that connect your medical condition to your armed forces service, Typically you might see a statement like "Mr; Jones medical condition is more likely than not related to his hospitalization in Baghdad, Iraq in 2004 for a leg wound. The Asknod book will take you through the initial claim, organizing the claim and documenting it. It also address the Decision Review Officer Review. 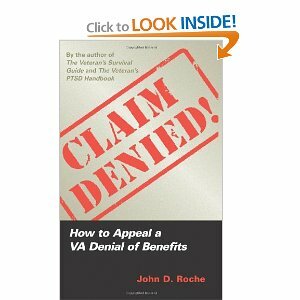 It is the only book that I have reviewed that addresses appeals to the Board of Veteran Appeals (BVA) and the US Court of Veteran Claims (USCAVC) in a comprehensive manner. 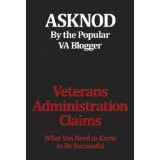 The AskNod book discuses filling of Notice of Disagreement, tricks VAROs use to deny the claim , the importance of the BVA Waiver of VARO review, why the the veteran usually gets the higher of disability ratings, Fenderson or staged ratings, and why you need s special statement in claims for Individual Unemployability. It also discusses how vets can get their effective dates for claims pushed back. AskNod also suggests bringing in an attorney after a denial if you have a well-documented claim at the VARO level. This is where the POA become important.You can not bring in an attorney until the claim has been certified for an appeal to the BVA. AskNod has noted taht the vets are getting smarter and appealing. A BVA appeal can take 3- 5 years. If there are nay open issues, the appeal will be remanded. AskNod also suggests bringing in an attorney to get the claim resolved at the VARO level. By law, the attorney can take 20 per cent of the claim. This can be expensive but it can avoid extending the claim for years. If you have been watching the Republicans at the state and national level, certain trends are obvious. Any GOP economic legislation is designed to favor the affluent and corporations, not citizens. In the case of the affluent, the GOP has blocked attempts of the Obama administration to make the tax system in the US more progressive and to reform the Bush tax cuts that favored the rich. An example of GOP favored legislation that affect corporations is the Keystone XL Pipeline. First, the GOP claimed that the pipeline would create 40,000 short term jobs. The real number is actually closer to 4,000, I More importantly, this pipeline doesn't not benefit domestic oil production because the oil that flows through the pipeline is for export. The Keystone XL pipeline is about energy industry profits and there is a significant environmental risk associated with the pipeline which is pressured and heated. A great deal of GOP legislation is also focused on peripheral social issues of a prescriptive nature. This is why the GOP is refereed to as the Party of No. Now welfare such as food stamps, no birth control for women, no abortion, no employment benefits, no unions and no sick leave. The GOP id desperately trying to overturn a conservative reform to US medical care. Us medical care costs twice as much as the other industrial counties of the world and worse, only 75 per cent of the population had medical insurance. The Affordable Care Act got rid of lifetime medical insurance caps and pre-existing conditions. Parents can bring their children under their medical insurance umbrella until age 26. Insurance companies must refund premium money to policy holders if the company doesn't spend 80 percent of more of its revenues on the policy holders medical expenses. That alone is enough to make a greedy corporatist cry. The GOP rarely creates any programs that benefit people unless the program is privatized. Medicare advantage is good example. This privatized version of Medicare is subsidized by traditional medicare to the tune of $900 per medicare participant. As of 2008, the federal government spent 12 percent more on Medicare Advantage than it did for comparable care under traditional Medicare. These subsidies (which added an additional $14 billion to the Medicare program last year alone) will gradually be reduced until payments to Medicare Advantage are in line with the cost of traditional Medicare. The prescription drug program, Medicare part D, was an unfunded GW Bush initiative. About one-third of the people who use Medicare Advantage are enrolled in the prescription drug program. There you have it. A political party is not people oriented, a a party that likes to proscribe what people can do, and party that doesn't do much for Americans unless it involves privatization.